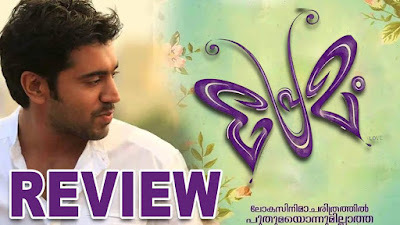 Premam's story revolves around the butterfly-like, romantic journey of George David (Nivin Pauly) from his teens till that fine day when he ties the knot! You will enjoy seeing the creative and colorful title cards that were showcased thorough the film. The butterflies, just as lovers, savour the nectarine sweetness of "Premam" and then flits away due to changing environments. The memories it leaves behind are fragrant and beautiful, somewhat bittersweet too. Time doesn't stand still and the butterfly has to move on to the next experience. Three new heroines make the film "Premam" a refreshing cinematic experience. There is Mary (starring Anupama Parameshwaran), the heart throb of all the teenage boys in the village. By the way, I love her hair for a very selfish reason! Simply this: I had hair just like that during my teens. The only difference is that it looked like it needed some treatment! PLUS, no queue of young fellas followed me anywhere....sigh! In this teenage love episode, the local casanovas of different ages wait for her by the tea shop. They walk with her on the narrow bridge, hoping desperately for a glance or a smile from her. Her expressions, her beautiful curly hair and the mischievous smile are lovely to watch. Then there is Malar (starring Sai Pallavi) who is his teacher but finds herself unable to resist falling in love with her student. There is a terrific sizzling chemistry between the two actors. Remember the scene where Nivin shows a gesture in class, indicating that she looks lovely in a dress....the glances they exchange without words are simply divine! Sai Pallavi as 'Malar' is a delight to watch. Her reactions to his SMSes and expressions are priceless! Her dancing was full of grace and a visual feast. Oh how I loved the 'Malare' song in this film!!! When Malar exits from his life, Nivin Pauly as George overwhelms us with a hard-hitting, realistic performance of a boy-turned-man who loses his heart and soul to the woman he loves. Personally, I felt that Malar's exit felt forced and artificial in the script - it doesn't feel authentic. Losing his love changes him forever in a way that heartbreaks do in human life. Then Celin comes into his life to "order a cake" on which he puts a question mark! In their first scene of meeting, I liked the dash of humour where his assistant keeps calling out "Velam, velam" reminding us of that funny, unforgettable scene in Manichitrathaazhu. Slowly, over time, Celine's infectious smile and child like laughter becomes the unexpected change in George's life, especially when she reveals her identity. A scene where she asks him to help her choose an outfit in a store is also symbolic of the fact that it is an act of trust and somewhat a kind of liking when a girl invites you to select an outfit with her, even if it is for some one else. There is another scene where he bakes a delicious looking red velvet cake that he offers her, watches her taste it and then what happens next. I liked the touch of realism with which the scene has been played out. It is then you feel that Nivin Pauly is a remarkable actor who can move you beyond words by just playing the character he represents. So, dear Nivin Pauly, take a bow! You, Nivin Pauly, deserve all the "Premam" that is coming your way from Malayalis. so I have been spending the last last 1-2 hours reading various articles on net about premam. mainly to find out the ending and more about Cilene character and mainly about the symbolism of the red velvet cake. found answers for 1 and 2, still searching for 3.. help me out if u can. What you said about Nivin Pauly is true. He acts very well and does it with ease. Also had the opportunity to meet him at the Chennai airport last month when we were on our way to Port Blair. A very simple guy with no airs. He chatted with us for some time before posing with my wifey for a picture. He was good enough to give me his e mail id too. Thank you very much for the malayalam movie information!!! :) :) :) Its great to know lot from your blog, keep posting more articles with good pictures. Definetly your blog is a sharing with friends type. Meanwhile I will also get to lots of latest Kerala news in malayalam from this new blog. Have a Good Day!